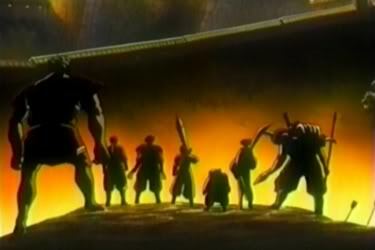 The Band of Seven are seven mercenaries brought back to life by Naraku using the Shikon Jewel shards. All of their names end in kotsu , meaning "bone". 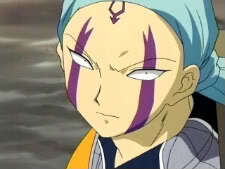 Bio: Bankotsu is the leader of the Band of Seven. 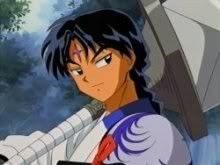 Both the youngest and strongest member of the group, he carries the huge Banryu halberd. Bankotsu is a skilled mercenary and has killed many people; he retains a sense of honor and compassion, but only for his six companions. After his resurrection, Bankotsu uses Banryu to kill everyone in the surrounding area. The scent of blood draws InuYasha's group to engage in battle until Naraku summons the Band of Seven back to him. During the fight, Banryu is damaged by InuYasha's "Wind Scar" attack, but it gains the ability to deflect that attack after Bankotsu repairs it with the jewel shards Renkotsu stole from Kagome. After learning that Renkotsu murdered Jakotsu, Bankotsu kills Renkotsu for his betrayal. With seven fragments in his body and two in his halberd, Bankotsu heads off to destroy InuYasha. In the manga, InuYasha gradually cuts the Shikon shards out of Bankotsu's body as the battle progresses until Bankotsu is cut in two, with Naraku stripping the remaining half of its Shikon shard. In the anime, Bankotsu slays 1,000 yōkai and kills 1,000 warlords with Banryu, transforming it into a demonic weapon that projects its wielder's hatred as powerful demonic energy. However, this proves to be his downfall as InuYasha reflects this attack with the Backlash Wave, crushing Bankotsu and shattering Banryū. Bio: Jakotsu, the second strongest of the Band of Seven and the third in command. He was a close friend of Bankotsu even before the group's formation, and Jakotsu is the only person Bankotsu trusts. His chief weapon, the Snake Sword or Jakotsuto, has segmented retractable blades that curve out across a great distance, making it difficult for an opponent to calculate his next move. 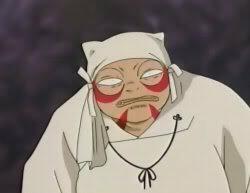 Jakotsu is depicted acting in a homosexual manner, such as admiring Koga's loincloth and claiming to have feelings for InuYasha, but because of his sadistic qualities, he basically wants to kill them in what he considers to be an affectionate way. Jakotsu loses a lengthy battle to InuYasha and is badly wounded, giving Renkotsu the opportunity to steal his Shikon shard. As he dies from the shard's removal, Jakotsu says he is happy because he got to fight the battle he wanted and he had fun with his second chance in life. Bankotsu later avenges his friend's death by killing Renkotsu. 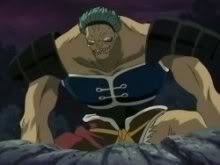 Bio: Suikotsu is the fourth strongest of the Band of Seven. He has a split personality: "Doctor Suikotsu" has a normal human appearance and is good, kind, and respected by villagers; "Suikotsu of the Band of Seven" has bristly hair and shaded patterns on his face, and is evil and bloodthirsty. 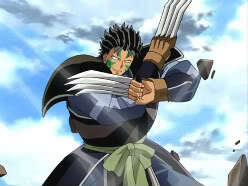 He has phenomenal strength, agility, and savage combat skills, and uses exceptionally long-bladed iron claws as weapons. He returns to his former village with his normal appearance, but still violent and willing to kill. After taking Rin as a hostage, he is beaten by the combined strength of Sesshomaru and Kikyo's sacred arrow, and asks them to remove the Shikon shard from his neck to let him die peacefully. Respecting his wishes, Kikyo reaches for the shard but is stopped by Jakotsu, who takes it to Bankotsu. Bio: Renkotsu is the second in command and is the third strongest member of the Band of Seven. An expert military engineer, he creates explosives and incendiary devices, including a type of flaming oil that he can spew from his mouth, and reconstructs Ginkotsu into a living artillery weapon that resembles a modern tank. He is also a gifted strategist and has some skill at hand to hand combat, although the only members of the group he surpasses in fighting skills are Mukotsu and Kyokotsu. He becomes resentful of Bankotsu's power and dares to betray him. After Ginkotsu self-destructs to save Renkotsu from Koga, Renkotsu takes Ginkotsu's shard and inserts it into his wounded shoulder. Later, he kills the injured Jakotsu after his battle with InuYasha and takes his shard. As punishment for hiding the shards and killing Jakotsu, Bankotsu kills him. Bio: Ginkotsu has metal parts on his body and various amounts of weaponry within and is the fifth strongest of the Band of Seven. His speech is rarely intelligible, only changing when angered. 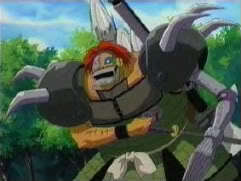 In his earlier, relatively human form, he carries a katana, an axe attached with a chain, a spear, "steel" wires, a grappler that replaced his left arm, disk-blades, a cannon on his shoulder, and a drill in his chest. He barely survives his first encounter with InuYasha and is reconstructed by Renkotsu into a siege tank with spider-like legs and disk-blade wheels. In his tank form, his offense is two main cannons along with the "steel" wires. In the anime, his additional weapons include a larger array of firearms, as well as a rocket-like launch of his main body, which contains wire launchers and a flamethrower. His final weapon is a self-destruct mechanism. He and Renkotsu fight Koga together. In the manga, he explodes when Koga stuffs pieces of Renkotsu's armor into his cannons, causing them to backfire. In the anime, he survives this attack, but goes berserk when Renkotsu receives a heavy wound to his left shoulder; to save Renkotsu, Ginkotsu fruitlessly unleashes his entire arsenal at Koga, then self-destructs in an explosion while shielding Renkotsu with his own jewel shard. Bio: Mukotsu is a short poison master and is the sixth strongest of the Band of Seven. He abducts Kagome and, in the anime, initiates a wedding ceremony with her but becomes angry at her reaction to his facial features, and attacks her when she tries to remove his Shikon Jewel shard. 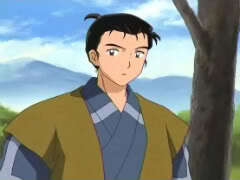 However, in the manga, Mukotsu attempts to harass Kagome until she stabs him, and soon after Miroku and Sango appear. Mukotsu poisons Kagome, Miroku, and Sango, nearly killing them, but is soon killed by Sesshomaru, who is immune to his poisons.